Most consumers don’t know how their Spotify streams get to their phones or wireless speakers, how their cell phone calls are sent from their city to another or how their credit cards are accepted around the world. Instead, they rely without much thought on the internet and electronics communications systems that span the globe. Despite a lack of consumer interest, these pipes comprise more and more of our economy, tand we’re going to need more of them (and more data centers) in the near future to continue our digital transition. The OECD did a nice job explaining in 2012 the importance of internet exchange points to the cost of transit, showing how places with more IXPs saw lower prices for transit and in effect became broadband exporters. Europe has moved to this model, while the U.S. has a slightly different for-profit IXP model that may be transitioning over to the more cooperative European model, thanks to the Open Internet Exchange organization. But IXPs are only part of the problem. First, a bit about backhaul. The internet is a series of networks that connect to each other at interconnection points located in data centers. Your ISP provides what’s known as last-mile service, which goes from a business or home back to a central office or head end owned by the ISP. At that point, your traffic heads out to a transit provider that connects to networks owned by content companies, retailers and clouds. If the traffic needs to cross the ocean, it will travel on submarine cables. These transit providers’ long-haul and middle-mile networks, as well as the submarine cables, are all examples of backhaul — how last-mile traffic gets back to the internet itself. The report concerns itself mainly with submarine cables, though. Many developing areas need more pipes connecting them to other parts of the world. This is both an economic issue (more competition between pipe owners lowers prices) as well as a resiliency issue (more pipes ensure that cable cuts will not shut down the communications network). 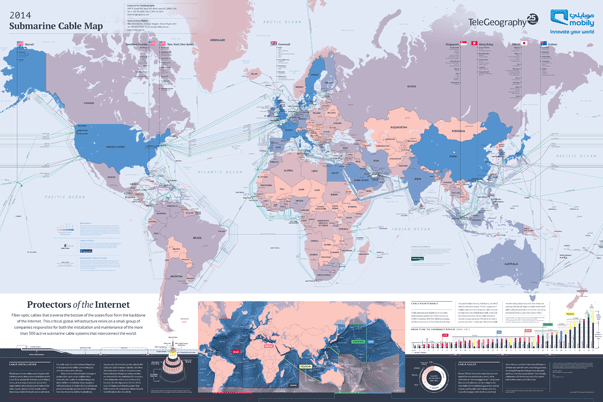 Not only do these areas need more submarine cables, but the ownership structure is changing, with big internet companies like Google (S GOOG) and Facebook(S FB) investing in backhaul at the submarine cable level as well as long haul fiber across countries. The OECD report lays out a detailed history of how liberalization and increased competition on the submarine cable side can lower prices and boost demand for internet-based services. In fact, the biggest takeaway from the OECD report — which should resonate with all internet stakeholders, from the ISPs to the content guys — is that the more open the system is in terms of access and peering, the more demand there is for these networks. That means ISPs that are trying to block content from entering their networks or force transit providers to pay for peering are doing their part to take more of the overall internet pie, but doing nothing to enlarge it. Meanwhile, efforts to put more IXPs in place, as Google has done in Kenya, help promote cheaper broadband and demand for more broadband. That’s also the rationale behind the open internet exchange effort in the U.S. While broadband providers try to appeal to an economic argument when they attempt to put in data caps or force transit providers to pay up, they are relying on an old economic model that doesn’t reflect the way the internet works or how its costs are structured. It’s like trying to apply the business models from the horse and carriage days to those of the railroad era. When ISPs and others ignore this economic model, they ignore it to the detriment of the whole ecosystem — including themselves and end users. It’s time everyone realized this. I hope the OECD reports help. While I agree generally with most of what you say, don’t you think that while broadband providers might be misunderstanding the economic model, to a great extent they are are bias towards short term profits rather than uncertain overall growth? I do think Wall Street’s emphasis on short term profits encourage this mindset. I’m not sure long term uncertainty is the right way to look at it, though. To be fair, profit margins will likely go down if these companies only provide pipes. And that means a wholesale restructuring of their business to match their cost structure with the new margin profile. However, if they can find products that are offered alongside the pipes and are competitive with other products coming out of silicon valley or wherever, then they can keep and perhaps grow margins. But that is hard and a completely different mindset.